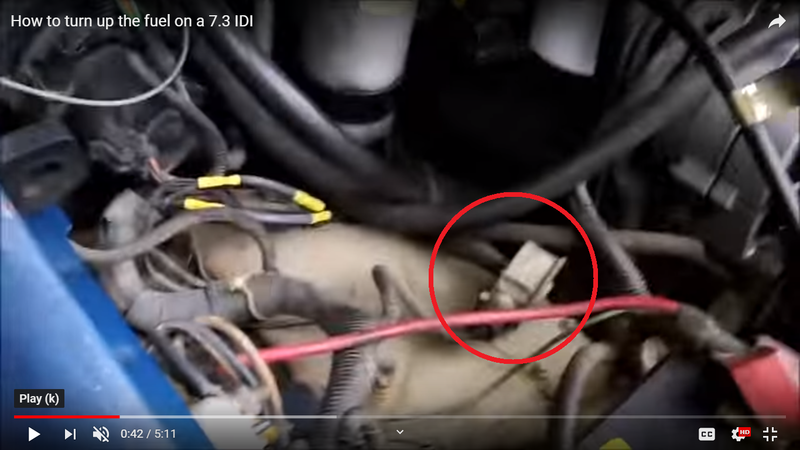 Diesel Forum - TheDieselStop.com > Ford Diesels > 7.3L IDI Diesels (Not Power Strokes) > what is this gizmo? (1) what it is called? (2) what does it do? Control cold timing? (3) where can I get another one? Basically this thing is a hockey puck with a cable plugged on the side and a single vacuum hose on the flat side that goes to the IP. It's near the fuel filter tower on the right wheel well. It seems to be for opening/closing a vacuum line which I think is connected to the cold timing advance on the IP. Mainly I just need another one, or some alternative solution. Last edited by dirtyBob; 02-10-2019 at 08:50 AM. Bump. Doesn't anyone know what it is ? Take a picture where the hose goes. Looks small to be a vacuum canister. It's not a canister. I broke the old one open and it had this spring in it, thermal type of spring. There was a diaphragm too if I recall. Here's the hose. A vacuum hose routing diagram would really help. 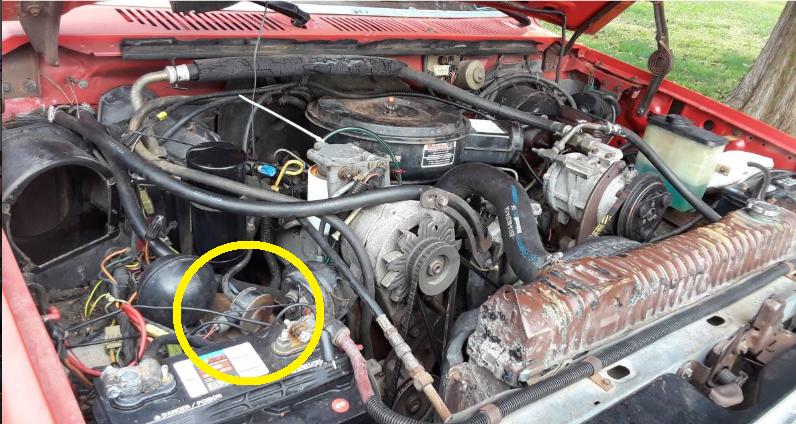 Without this mystery gizmo from the 80s of the ford diesel pickup truck world, starting the truck is very hard. It needs the cold timing advance to start. You can start the engine but without the timing advanced its hard on batteries. This thing apparently controlled it. Does anybody know what this thing is called and what one can do to replace it when it burns up, as did mine? It's like out of production by 20 years at this point I am guessing. And yeah, I know I need a newer truck. Last edited by dirtyBob; 02-10-2019 at 08:23 AM. Here's a picture of the missing gizmo. This is from a 1985 with the 6.9. This close up pic was taken from a 1996 7.3 powerstroke engine bay. Apparently this mysterious highly confusing strange bizarre wonderful missing mystery gizmo was used to control timing advance from about 1982 to the late 90s. Nobody owns one? Last edited by dirtyBob; 02-10-2019 at 08:48 AM. It needs the cold timing advance to start. You can start the engine but without the timing advanced its hard on batteries. This thing apparently controlled it. Not true, back in the day FoMoCo stated the cold advance and cold fast idle are strictly to lessen cold engine smoke complaints. 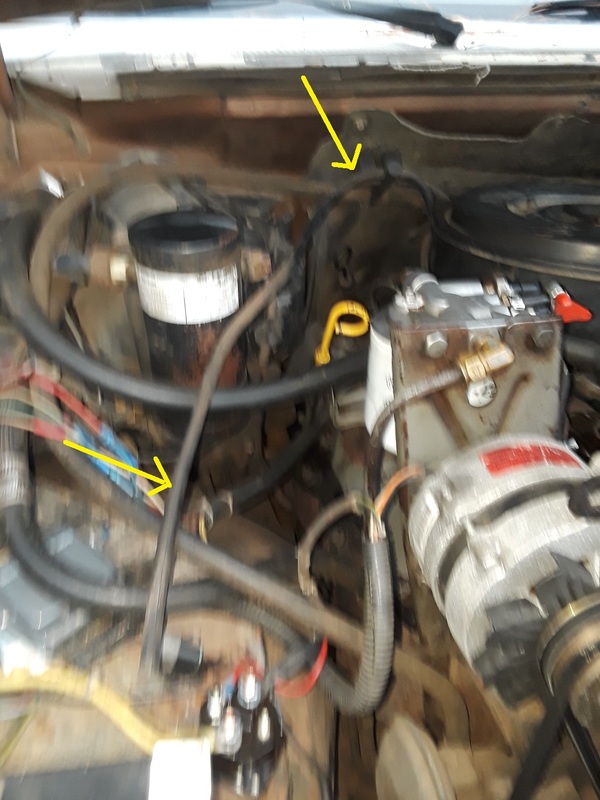 Bought my pickup new in '91 and disconnected the timing advance about 2 weeks later. With the advance on, it sounded like the pistons were going to fly through the hood. Can't be good on an ice-cold engine. And with starting, glow plugs and fuel system in A-1 shape mine will start in 3 seconds at 10°-20°. 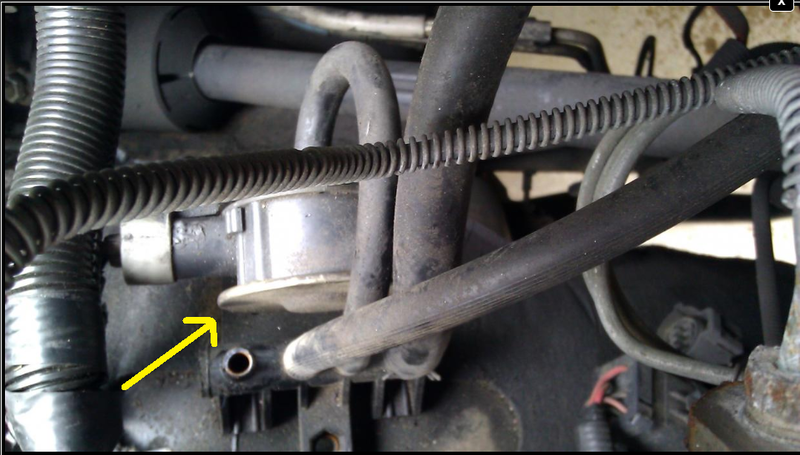 According to the shop manual, the component you have circled is the low vacuum warning switch. I believe it to be a barometric pressure switch...it's purpose is to adjust air mixture relevant to the elevation your at. 1992 f-350.4x4 srw.rebuilt e4od.rebuilt injection pump. no soup bowl,no muffler,straight pipe.. 8 foot power angle Artic blade/7 1/2 ft p/a Fisher blade. 280,000kms and counting.Paint to come. I'd be interested in knowing just how that works?? Ding ding ding. That's it. Part identified (thank you). Apparently it is wired to the idiot light for brakes so you know the vacuum is low if it is. I just don't understand why the cold timing advance is not working now, but maybe it's because when I threw out this smoking low vacuum warning device, out I also left the vacuum tube disconnected and the cold advance is run by that. It's nice to know it won't make the engine easier to start (thanks). Probably mine has air in the lines despite trying every trick known to man to cure that, return lines, olives, washers, on and on, also probably a somewhat worn starter and weak-ish batteries now. I might try and replace the (now identified) low vacuum warning switch since power brakes are handy on these trucks. I bet I'm headed to the junk yard (120 miles round trip) for one. On a diesel? How would that work? On a diesel the airflow into the engine isn't controlled, it's wide open all the time. Power is controlled by how much diesel is injected. 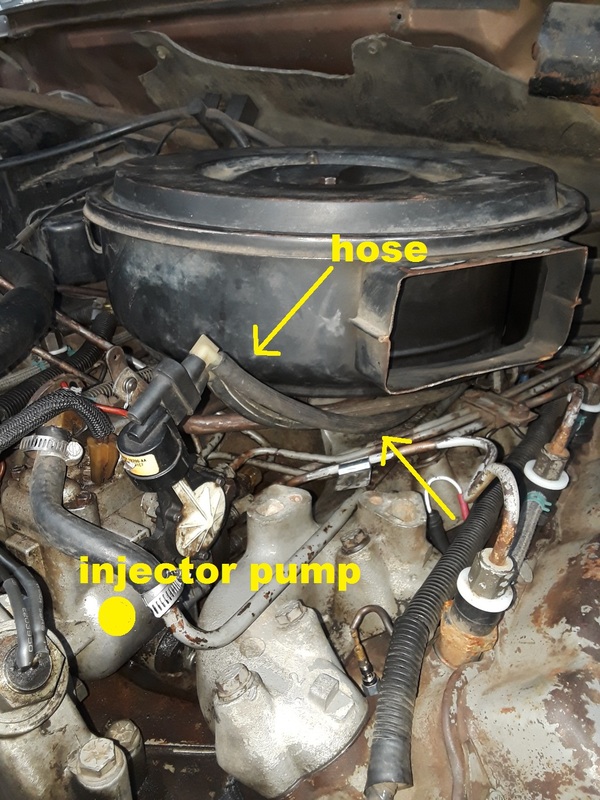 The injection pump is all mechanical and is controlled by the cable from the accelerator pedal. Yeah, like I stated above, mine starts real quick, but it also lets me know real quick-like when I suddenly develop a air problem in the drainback system. I can't remember and I could be wrong but I think the cold timing advance is governed strictly by one of the 2 coolant temp senders like the fast cold idle is. And if your starter is due for an overhaul, getting it rebuilt will make a big difference in cranking speed and quicker startup. Last edited by LMJD; 02-10-2019 at 04:02 PM. Put your location in your profile - someone might be close enough to help you.